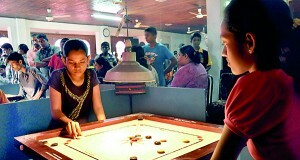 Seneth Rajapakse beat Senuka Karunanayake 25-1 in a one setter final to clinch the Under-13 Boys Singles championship at the 12th Junior National Carrom Championship which began at Maharagama yesterday. Rajapakse and Karunanayake reached the final after beating Sahan Nirman and Sathsara Induranga respectively in the semi-finals from 61 other competitors. Nirman won the third place playoff beating Induranga 25-4 in the consolation final. The competition was held as single setter knockout as the Under-13 Boys Singles came to an end within a day. Meanwhile Tharushi Himahansika and Lekumi Nonaya reached the final of the Under-15 Girl’s Singles to be played today beating 44 fellow competitors. Himahansika beat Shalini Senadheera 25-14 in the first semi-final while Nonaya overcame Sadini Nirasha after a thrilling battle which ended at 25-20 in favour of the former.